What started out as a simple room divider has transformed into an entire world of beautiful folding room dividers that not only serves as the originally intended room dividers, but also a statement of style and culture. They are used today to make multiple rooms from one, or to complete a look or style of elegance, asian culture, or just tranquility and calmness. 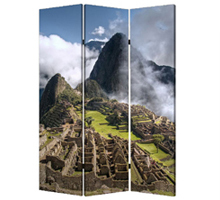 Today's room dividers and screens have many things in common – they are usually made from materials such as paper, wood, or cloth with two or more frames connected securely by metal hinges. Because these screens are so durable and stable, it is easy to move them from place to place, wherever their style and function is needed. Some portable room dividers even come with wheels that allows for maximum mobility. Shoji screens feature clean and simple wooden frames that have insert panels to allow light to come through without hindering the sweet function of privacy. The lattice pattern in the middle panel is usually woven into a geometric pattern to provide both durability and an artistic way for light to come through. 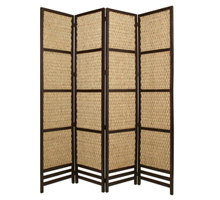 Here, at Tansu.net, we invite you to browse through our great selection of room divider screens. 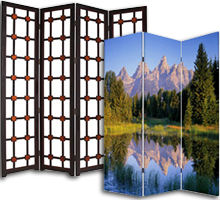 You'll find many types of screens – from the artistic folding screens, to the rustic room dividers. If you are looking for the beautiful nature-themed and traditional style Japanese screens, then you have come to the right place! 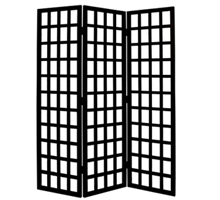 Without further ado, enter and find the perfect Shoji screen for you and your home!